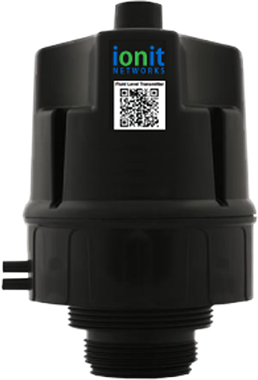 The ION-9075 is a cellular (GSM), battery-powered, ultrasonic fluid level device that makes measuring and remotely monitoring fluid levels easy and accurate. The #9075 is a fully self-sufficient fluid sensor, and can be provisioned on most GSM networks including ATT and T-Mobile. Ideal for remote monitoring where access to electrical power and wired Internet connections are not available. Perfect for monitoring outdoor commercial fuel tanks. The #9075 can be configured to report daily or weekly to the IONIT Cloud software.